This T-shaped baby carrier (mei tai) is richly layered in the intangible cultural heritage and symbolism of the Miao ethnic group of China. While its most basic function is to wrap the child and keep it close to its mother, the carrier displays social, cultural and historical meaning in every stitch — the Miao see themselves as a people that wear their history. 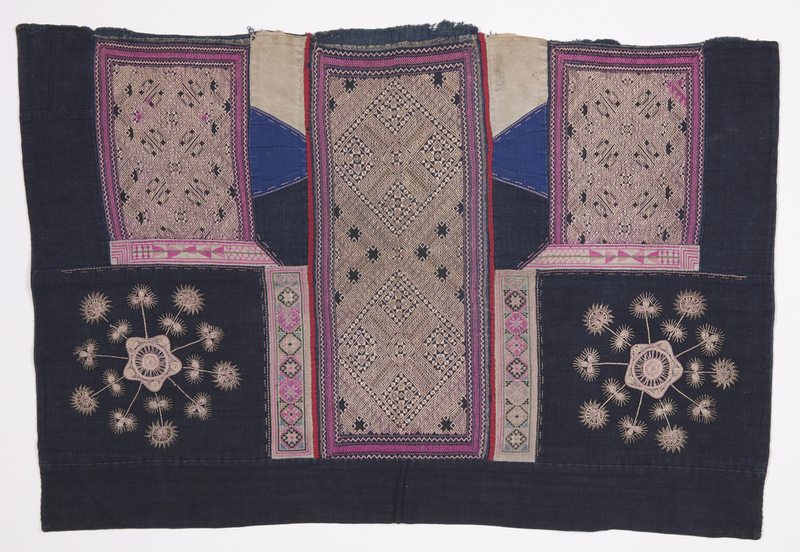 Unlike the majority Han Chinese who had a rich textual tradition, the Miao expressed and shared their collective heritage through their indigo dyeing and needlework. Girls as young as four or five began to learn the skill through observing their mothers. Each group of Miao are distinct and have different origins, which are reflected in their textiles. Stitches and motifs represent creation myths, heroes and the stories of their migration. This carrier is embellished with designs that are likely from Tong-dau county in Hunan, China. In the central panel are auspicious lozenge patterns, filled with pointed four-leaf motifs representing the oriental sweetgum leaf. Also abundant is the eight-petaled flower design, which represents the wild roses that cover the hills and fields of Guizhou, possibly reflecting their migration routes. The designs on either side at the bottom of the carrier are variations on the “moon flower” design, a distinctive Hunan Miao design, in which the sun is in the center and the stars radiate from it, together representing the universe. While we look at the carrier and see ornament or decoration, the Miao see a rich visual language steeped in symbolism. The images of good fortune and nature’s forces, like birds, flowers and creatures near water serve as talismans and are infused with prayer and spirits to protect their wrapped babies from harm. Sometimes a needle would be left in the needlework to prick evil spirits and drive them away. Miao women also often intentionally leave a spot unfinished, as a way to fool evil spirits into believing that the carrier is not in use. It also serves as a symbol of continued diligence; leaving something unfinished and imperfect is a way to encourage improvement. Imperfection is also a way to be humble before the gods, as the Miao believe that no one should be as perfect as they are. Sometimes this comes in the form of disjointed designs or using colored threads in the middle of a monochromatic design. Most women will not sell baby carriers, but if they do, they often save the ties for themselves, symbolically keeping them connected to the child. This carrier is missing its ties—perhaps somewhere in China, a mother keeps them as safe as she once kept her child. Joanne Schmidt is Acting Curator of Indigenous Studies at Glenbow in Calgary, Canada. Her background is in the study of the expression of identity through material culture, and her particular interest is in the role of women in ensuring cultural survival in assimilationist and colonial contexts.